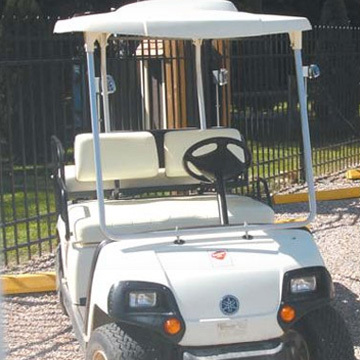 Strawberry Park is pleased to offer a limited number of Golf Cart rentals to our campers. These electric carts feature a front and rear seat, headlights and a roof. Rental reservations are taken in advance just like our site reservations. Carts must be operated in accordance with all published rules. Please read and comply with the operating instructions provided when you pick up the golf cart. Violation of these rules may result in loss of use with no refund. All passengers must be fully seated on a seat at all times.. Drivers are not permitted to hold anyone (including toddlers) on their lap. Speed limit of 8 MPH will be strictly enforced. Camper liability for damage to cart is not limited to $200 security deposit required at time of registration. Carts are for use within Strawberry Park and may not be operated on public roads. Carts may be picked up 1 PM, , and must be returned before 12 Noon. Please return cart with battery charged.. Extensions are permitted subject prior approval by management.